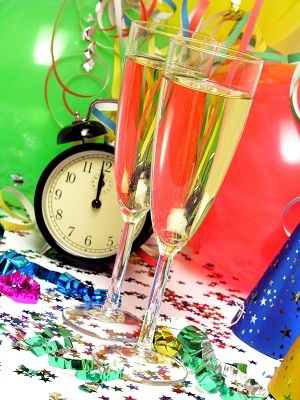 Here is a collection of New Years Eve party games for you to choose from. This is the type of party you could take in any direction. You can base it on looking back over the year or looking ahead to the new. Another angle is to just plan the games that your guests will most enjoy. Remember, they have come to count down to the new year and mingle with your other guests. It's that time, when everyone gets to let their hair down and party like there is no tomorrow. A list of My Favorite New Years Games can be found here. 1. Make sure to inform your guests of the dress standard before they arrive. Sometimes formal wear and the games you have planned do not mix. You want your guests to be comfortable for the entire evening. 2. If your guest list consists of people who do not know each other, avoid games that force strangers to mingle in a way that is too personal (i.e., touching each other or asking overly personal questions), as this can make guests feel very uncomfortable. 3. New year's eve is the epitome of party and entertainment. So, while planning a bash on new year's eve for your friends, make sure you have a heavy dose of entertainment ready to go. Remember that your guests will be there several hours. It is wise to overplan the activites and games, just in case some of them do not take as long as you expected. 4. Plan a variety. Have some fast moving games, and some games where you just sit and think, like trivia. Allow time for socializing between each as well. 5. If serving alcohol, it would be wise to assign designated drivers for guests who will be leaving at the end of the night. Many cities offer free or low-cost cab rides on New Year's Eve night, so check with your local newspaper or police department for details before heading out.